The entrance to this little tucked-away gem built anticipation as it was. 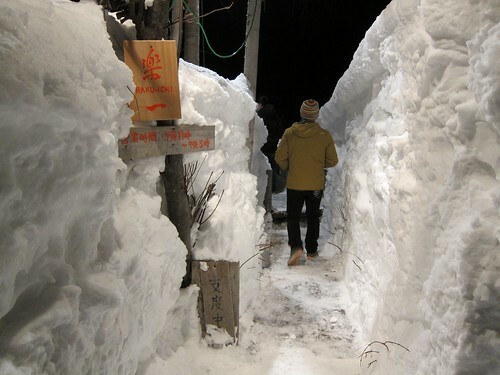 It snows in Hokkaido, Japan’s northernmost island, more than anywhere else in the world – without exaggeration. So we were a week in, essentially in this winter wonderland with snow embankments higher than 20 feet everywhere we looked. This little restaurant, built entirely with wood, was constructed with the owner’s own hands. There were hallways of snow and a bridge to get to the place. We started with a beautiful sake from Shikoku, the smallest and least populous island of Japan. And then came tiny appetizers from Japanese pickled shallots to cured salmon and seaweed and herring. 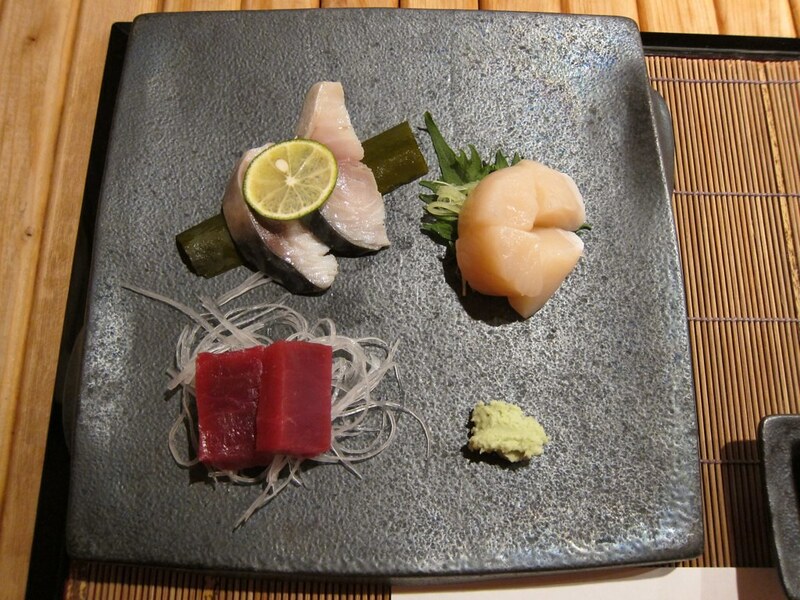 We moved on to a sashimi trio of cured mackerel, scallop and the deepest colored tuna I’ve ever seen in my life. I will rave about the soba, later on, but I can’t emphasize enough how this sashimi was just so heavenly, so fresh. For the third course, we had thinly sliced seabream, topped with Japanese ginger, daikon shoot, soy, yuzu and shiso – an amazingly vibrant couple of bites to savor. 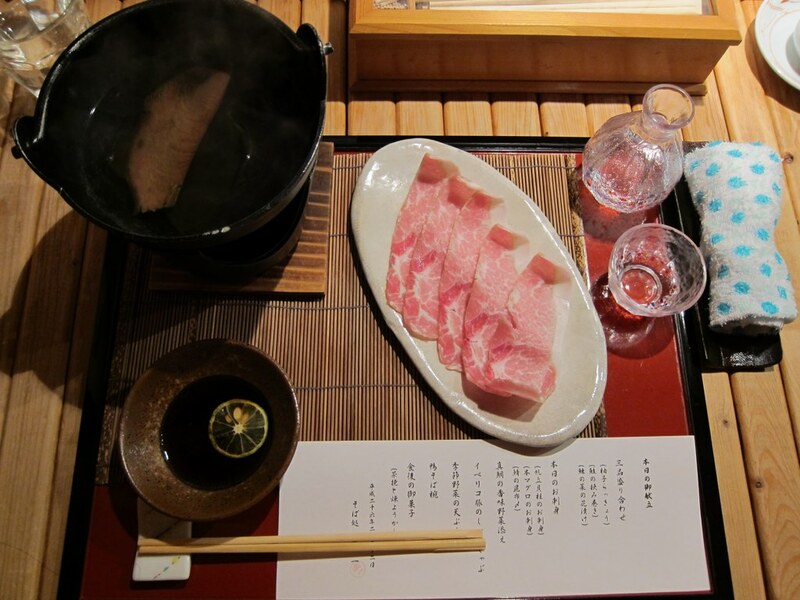 And then, they brought out small pots so we each could enjoy our own little shabu shabu, featuring ultra-thin, but beautifully marbled, slices of pork. We were instructed to submerse each slice a mere 10 seconds each in the bonito and konbu dashi, then dip in briefly in ponzu before eating. So good. So comforting. Warm water was distributed so we could take sips of our broth before it was bussed. The “intermission” of sorts came in the form of perfectly fried vegetable tempura. So light, so fluffy – and so fresh. The breading was perfect. 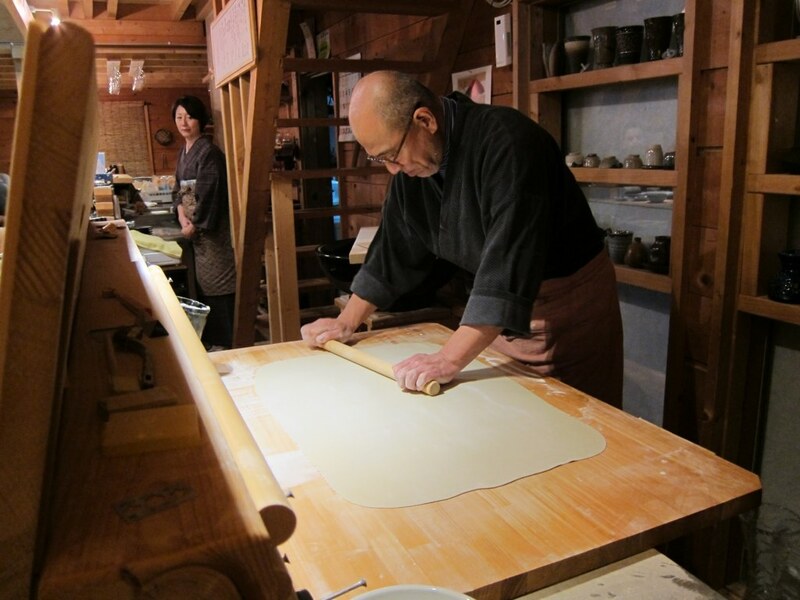 I describe it as an intermission because it was while we enjoyed our veggies that the Soba Master and owner of Rakuichi began making our soba noodles. From kneading the buckwheat dough to rolling it out and finally, cutting it. I alternated between pieces of veggie tempura and taking paparazzi shots, it was so intriguing. 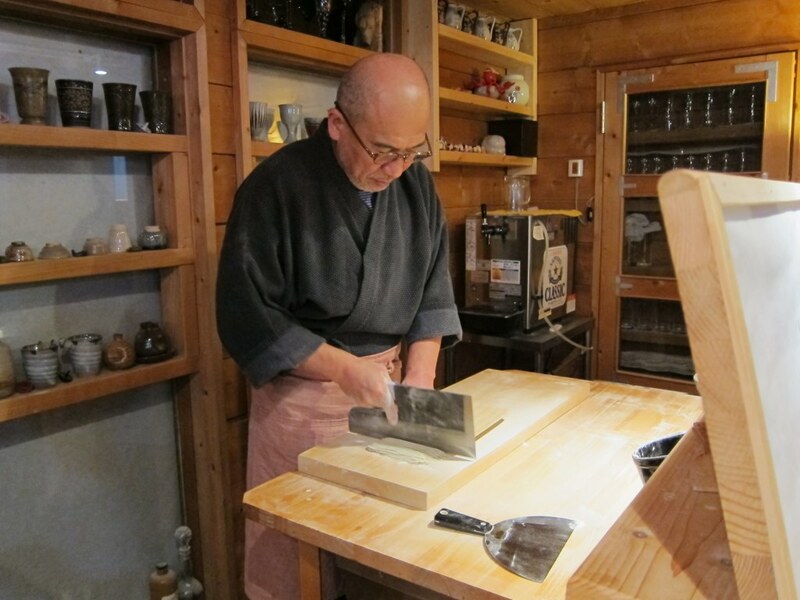 I had taken a soba making class before, but of course, he did it in 10% of the time I took with his own 100% buckwheat recipe. 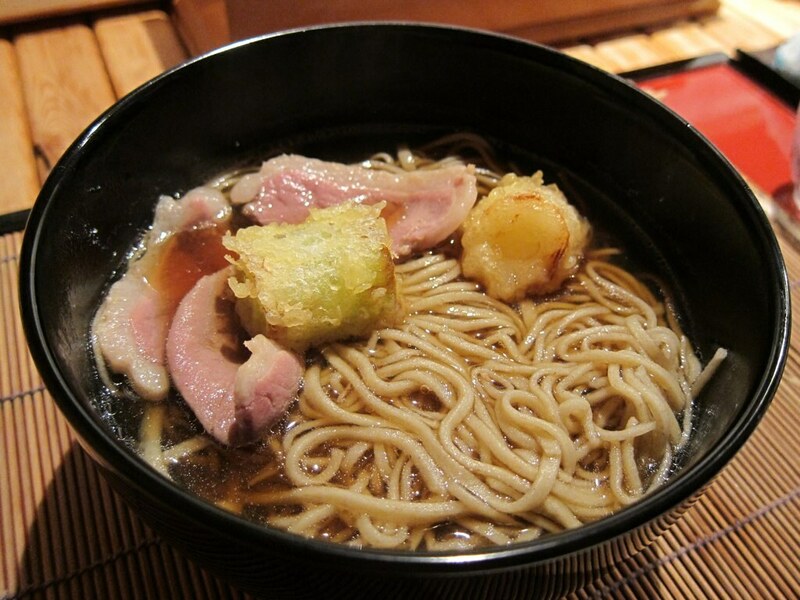 The noodles were submerged in just enough duck broth, topped with duck slices and green onion tempura. The bowl was incredibly succulent yet clean tasting; I quite frankly didn’t want it to end. 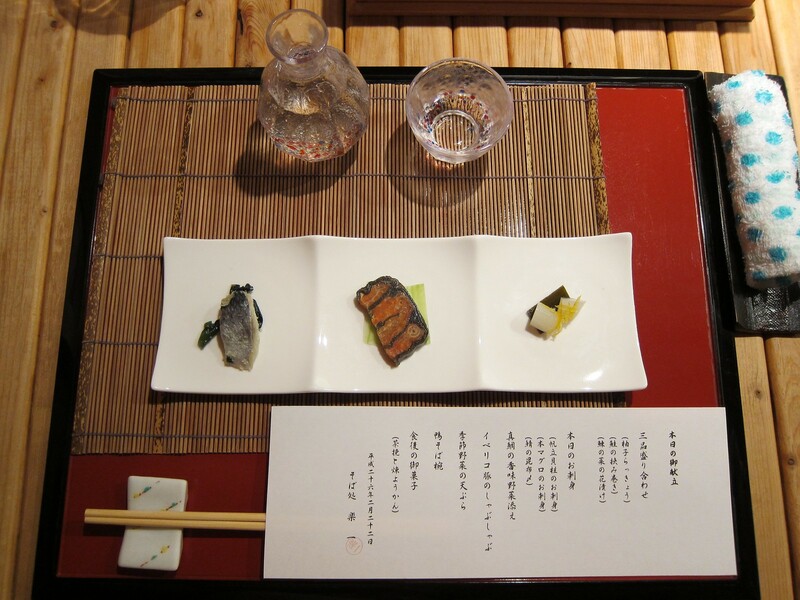 We ended with a couple of simple, green tea and red bean jelly cubes – a final point on an epic meal. It was only then that I noticed the owners’ picture with Anthony Bourdain on the wall. Though Rakuichi was on No Reservations, it took us reserving our seats over 2 months in advance to eat here. Your Japanese speaking friend will need to do that, too. But it was so, so worth it. With sake at only $75 per person, it was a steal. And there is no tipping in Japan. P.S. – Credit goes to a Miss Katie Powell for making the reservation here – and also for basically planning our entire time in Niseko. This entry was posted in Food, Japan, Sake, seafood, Travel and tagged #TravelTuesday, Annupuri, Anthony Bourdain, Hokkaido, Japan, Japanese, kaiseki, Midori Rai, Niseko, soba, Tatsuru Rai. Bookmark the permalink.